Aboard the International Space Station, Expedition 54 Flight Engineers Mark Vande Hei and Scott Tingle of NASA and Flight Engineer Norishige Kanai of the Japan Aerospace Exploration Agency (JAXA) discussed life and research on the complex during a pair of in-flight interviews Jan. 3 with KMSP-TV, Minneapolis and the Voice of America. The interview which seems to be live gets a remarkable end, which starts at about 13.55 in the video what looks like a glitch in a Chroma Key Layer. A chroma keying technique is commonly used in video production and post-production. So if it is really a glitch in a Chroma Key Layer, then it is not a live broadcast but a post-production, moreover if that should be the case then we may wonder whether the interview was recorded from an unknown location on Earth and edited by NASA? If we look at a similar interview recorded in 2013 then it seems that certain “Live” interviews indeed happen from a location on earth instead directly “Live” from the ISS. During that 2013 interview Chris Cassidy accidentally admits they are filming in the USA. Chroma key compositing, or chroma keying, is a visual effects / post-production technique for compositing (layering) two images or video streams together based on color hues (chroma range). The technique has been used heavily in many fields to remove a background from the subject of a photo or video – particularly the news casting, motion picture and videogame industries. A color range in the foreground footage is made transparent, allowing separately filmed background footage or a static image to be inserted into the scene. Is the ISS live stream feed really "Live" or is it fake and it is all a matter of post production and editing? 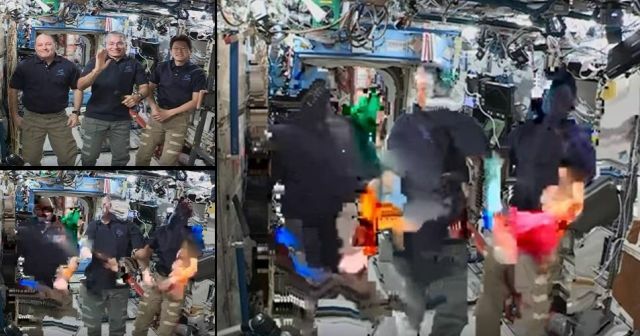 Video 1: Fast forward the video to 13:55 and you see a glitch in the three astronauts’ layer. Video 2: Fast forward the video to 00:56 and you hear Chris Cassidy’s remarkable statement. Lol, and they have flies or moths on ISS?? ?